For today's recipe, we turn to a brand new type of cuisine for Casual Kitchen: Catalan food. We were the lucky recipients recently of Colman Andrews' exceptional book Catalan Cuisine: Europe's Last Great Culinary Secret. I've selected a recipe from it that is highly typical of this cuisine, yet still passes our five easy questions test. We're always partial to any recipe that takes easy-to-find ingredients and combines them to make unusual flavors and tastes. And we were so happy with this dish that we can't wait to return to this cuisine for more of the same. Finally, your guests will never guess that such a rich, hearty and amazingly delicious soup can be made from start to finish in under an hour. French- or Italian-style bread, toasted or lightly fried in oil. 1) In a large pot, heat the oil to medium. Add the onions and saute for several minutes until they are beginning to turn brown and caramelize. Add the garlic and saute for 1-2 more minutes. Then add the tomatoes. Saute uncovered, stirring regularly, until most of the liquid has evaporated away and the tomatoes have completely broken down and have more or less melted into the onions (at least 15 minutes). 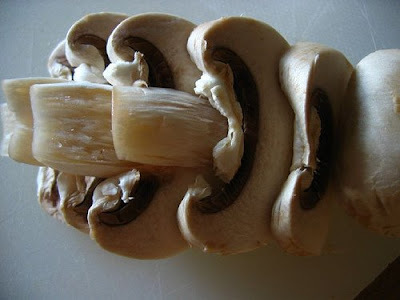 2) While the tomato/onion mixture is cooking, wash the mushrooms and slice or quarter the larger ones as you see fit. 3) Turn heat to medium-low, add the mushrooms to the pot, and saute for 10-15 minutes or until the mushrooms have begun to shrink a bit. 4) Add the stock, bring to a boil, and then simmer on low heat for about 15-20 minutes. Salt and pepper to taste. 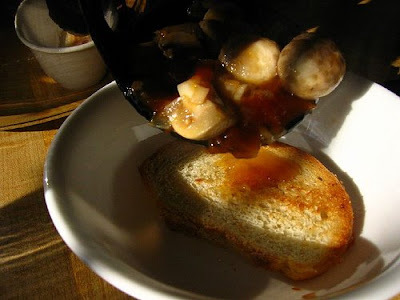 5) A few minutes before the soup is done, toast or pan-fry (use a thin coating of oil and brown the bread on each side in a non-stick pan) thick slices of the French or Italian bread. Place a piece of the toasted bread on the bottom of each soup bowl, then ladle the soup over it. If you're interested in looking at the full collection of photos from the making of this recipe, I've posted them on my flickr page. 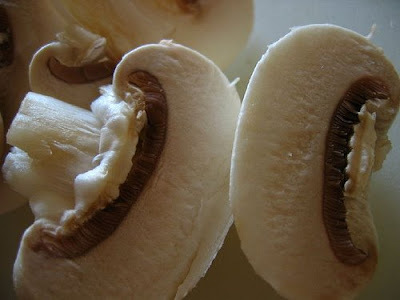 Warning: there are lots of photos of mushrooms. If you enjoy reading Casual Kitchen, tell a friend and spread the word! Another way you can support me is by submitting this article, or any other article you particularly enjoyed here, to bookmarking sites like del.icio.us, digg or stumbleupon. Clicked through from your tweet - this looks fantastic!! 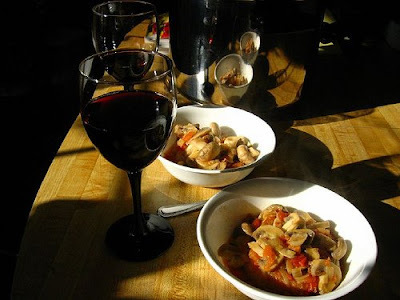 I love spanish recipes and am bookmarking this for the weekend. LC, thanks for the feedback! Be sure to let me know how the recipe comes out for you.